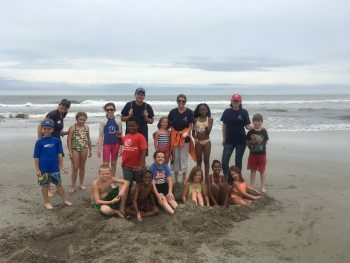 Rising third- through fifth- graders from Carteret and Onslow counties spent time learning about the coast and exploring the places they call home during the North Carolina Coastal Federation’s Coastal Discovery Camp from June 19 through 21 and 26 through 28. The first week of camp was held in partnership with Hammocks Beach State Park, and camp activities took place at the park’s mainland and surrounding islands. Thirteen students from Swansboro Elementary, Maysville Elementary and the Morehead City Boys & Girls Club explored Jones Island, learned all about oysters and visited Bear Island on a ferry. The last day of the first week was spent at Bear Island. The kids were immersed in marsh ecology lessons during the first day of camp. At Jones Island, they learned about stormwater runoff and how it affects the estuary. They also spent time using seine and dip nets around the living shoreline and checking out the critters that live there. During the living shorelines exploration, students did an activity that compared shoreline stabilization methods, showing how living shorelines help to prevent shoreline erosion. Due to the rain, they participated in mostly indoor activities on the second day. This included a fish printing craft and a marine debris game where the campers pretended to be birds and used clothespins as beaks to try to pick up “food” while avoiding pieces of debris. That afternoon, the campers made oysters out of egg cartons and learned about why oysters are so important to the estuary. During the last day of camp, students received their Junior Ranger certifications and then piled onto the Lady Swan, a covered ferryboat, and took a trip to Bear Island, which is part of the park. There, they learned all about sea turtles — their habitat, threats and more. This was tied into a lesson on marine debris, as sea turtles can mistake plastic bags and other debris for their food. A big treat of the day was also getting to see a marked off sea turtle nest. “Hammocks Beach State Park is a beautiful place to use as a living classroom. 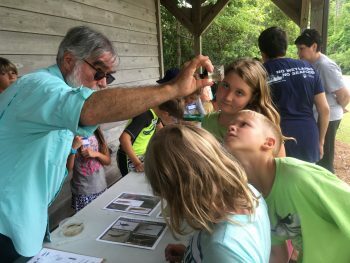 The campers loved learning about the different habitats there, and we are grateful to the park staff for partnering with us to host these programs,” said Rachel Bisesi, coastal education coordinator for the federation’s Ocean office. Mr. Woz shows campers macroinvertebrates from a nearby pond. Before heading back to the mainland and wrapping up camp, they used seine nets in the salt marsh on the back side of Bear Island. The second week of camp was held in partnership with the Core Sound Waterfowl Museum & Heritage Center. Fourteen elementary school students from Smyrna Elementary and the Beaufort Boys & Girls Club joined in for three days of adventures in Down East Carteret County. The campers were excited to begin their week at camp with a macroinvertebrate and water quality activity. A local teacher, Mr. Woz, taught them about how certain macroinvertebrates are good indicators of how clean or dirty the water is. Mark Smith, manager of the federation’s North River Wetlands Preserve, joined the group on day two for a morning of fishing. The campers caught a variety of things, including pinfish, pufferfish and even a blue crab. Campers admire their findings during the mole crab activity. That afternoon, they toured and learned about places and things that shape Down East culture. They visited the restaurant Mr. Big Seafood and also received a lesson on decoy carving at the museum, where they even got to try it out for themselves. At the end of the day, they took part in an interactive lesson on stormwater runoff and then went “stormwater slip and sliding,” where they pretended to be raindrops on an impervious surface. The last day, which was a trip to Cape Lookout National Seashore, was the most exciting for them. Though all lived in the area, many had never visited Cape Lookout before. The day was spent on various activities — learning about local history and wildlife. They learned about life in the intertidal zone of the sea, which included a fun lesson on mole crabs. During the afternoon, they got to take a ride around Cape Lookout while learning about the history of the area. 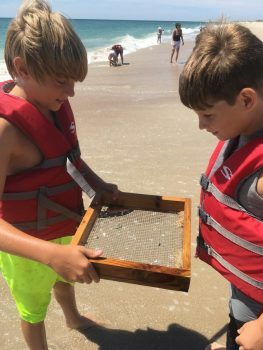 Both camps focused on lessons to expand the students’ knowledge of local natural resources and coastal sciences, as well as ways to work together for a clean and healthy coast. These camps were sponsored by: Albemarle-Pamlico National Estuary Partnership, Boys & Girls Clubs of Coastal Carolina, Walmart’s Community Grant Program, the Croatan Chapter of the Sierra Club, Carteret-Craven Electric Cooperative, Unitarian Coastal Fellowship, Transportation Impact and individual donors.